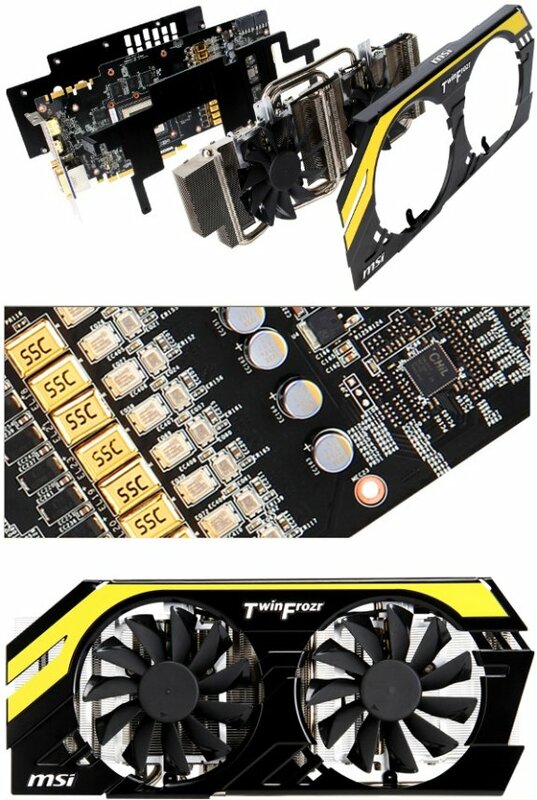 MSI introduces its GeForce GTX 680 Lightning graphics card with Twin Frozr IV cooling and Unlocked Digital Power architecture. The card features a 1110MHz base clock, 1176MHz boost and 2GB GDDR5 clocked at 6008MHz. Leading mainboard and graphics card maker MSI has just announced the release of the N680GTX Lightning, the new king of the graphics card world equipped with the NVIDIA GeForce GTX 680 GPU. The N680GTX Lightning utilizes proprietary Unlocked Digital Power architecture to unleash the full performance of the graphics card without any extra modifications. The innovative patented GPU Reactor power supply back plate also reduces power supply noise and improves overclocking stability. the N680GTX Lightning is kept cool by the Twin Frozr IV cooling solution with Dust Removal technology, dual temperature-controlled fan setup and SuperPipe. When compared to the reference board, temperatures are reduced by 16˚ and noise is lowered by 6.7dB, thereby providing optimal balance between thermal and acoustic. The MSI N680GTX Lightning uses Military Class III components which have been rigorously tested by an independent laboratory to deliver extreme stability during overclocking. The 3x3 OC Kits, designed specifically for overclockers, are also the perfect tool for monitoring graphics card status. As the newest flagship graphics card, the N680GTX Lightning offers advanced proprietary design features which deliver unparalleled performance, cooling, materials, and software applications to satisfy even the most extreme overclockers. Unlocked Digital Power architecture, which originally launched the HD 7970 Lightning to new heights by breaking numerous overclocking records, returns in full force in the new MSI N680GTX Lightning and consists of Unlocked Bios, Digital PWM chip and improved power supply design. Unlocked BIOS provides one-touch unlocking of graphics card protection to unleash full performance without the need for modification. Digital PWM provides a more stable and precise voltage signal than conventional analog designs. The faster response time allows voltages to be adjusted more quickly and accurately during overclocking. The improved power supply design delivers double the power of the reference board to give a great boost to overclocking power. The pioneering GPU Reactor patented power supply back plate in particular provides high power to the GPU and reduces power supply noise while improving overclocking stability. The N680GTX Lightning based on Unlocked Digital Power architecture is the perfect tool for helping gamers break overclocking records. The N680GTX Lightning comes with MSI’s latest Twin Frozr IV thermal design and exclusive Dust Removal technology, which reverses the fan for 30 seconds upon startup to remove dust from the cooling system and maintain optimal cooling performance. MSI’s PropellerBlade technology, which provides 20% more air flow than a conventional fan, found on the large dual 10 cm temperature-controlled fan setup, SuperPipe technology, and a nickel-plated copper base allow the N680GTX Lightning to run an impressive 16 degrees cooler and 6.7dB quieter than the reference thermal design! The N680GTX Lightning also comes with two form-in-one heatsinks that not only improve cooling of the memory and power module but also increase structural strength. The Twin Frozr IV’s thermal design delivers the perfect balance between Thermal and Acoustic! MSI Military Class III components have passed rigorous tests by an independent laboratory to meet MIL-STD-801G standards, guaranteeing high quality and stability. Military grade components used in the MSI N680GTX Lightning include CopperMOS with a copper-based thermal design, Tantalum Core Hi-c CAP, Golden SSC with gold-plating for improved cooling, and Dark Solid CAP with nickel-plating for improved durability. MSI Military Class III components give gamers the ability to overclock with confidence! Designed exclusively for overclockers, MSI’s 3x3 OC Kits offer a variety of powerful features. V-Check Point provides three separate gauges to monitor GPU, Memory, and PLL voltage. When used with MSI's exclusive Afterburner overclocking utility, Triple Overvoltage support means that GPU, Memory, and PLL voltages can be quickly adjusted. Triple Temp Monitor keeps track of GPU, Memory, and MOSFET temperatures. Overclockers and gamers alike can use the 3x3 OC Kits to fine-tune their graphics cards and monitor its status in real-time.